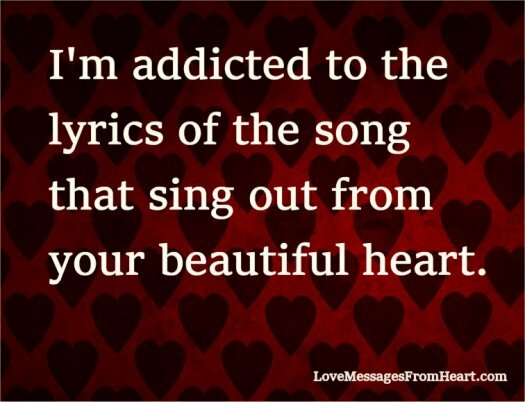 that sing out from your beautiful heart. I keep hearing the soft sounds of the love song with the light tender music of heartbeats singing to the melody of our love. You are what love songs are written and sung about. The happiest music of them all and my absolute favorite music is the love song about you and me. Not a single love song ever composed comes close to the feelings you evoke in my heart. You are the most beautiful love song, the most beautiful music ever created, the most beautiful person in this world. With you by my side, my happiness is reflected in my heart … it is glowing with love. Thousands of birds sing the calming song of romantic melody … it is a special serenade to celebrate our love. There is one music that will never go out of fashion. It is the music of our love, sung from deep within our hearts.